in the hospital the past week. A picture of my grandmother, etched in my mind from my childhood. A plump rosy-cheeked lady, lavender-purple cotton bandanna tied around her head with a stray pink foam curler peeking out from around the side of her ear. Creak-squeak, creak-squeak in a steady rhythmic pattern, creak-squeak, creak-squeak went the metal springs as she rocked in her modern blue velvet rocking chair. Her floral dressing gown set the backdrop for her worn and wrinkled hands hypnotizing as the strands of colored yarn swiftly curled around the hook producing colorful squares, while I played on the floor with my toys. Memories of Nan’s house were that of sight smell and sound. A pot was always bubbling on the stove, the air humid yet filled with the smell of vegetables cooking, meat roasting, and bread baking. The house was a little cluttered with ornaments and glasses collected from mail-in box tops, gas station giveaways and Red Rose tea figurines; the fawn, buffalo, sea lion, rabbit, owl, the cat and the fiddle. The armadillo was the one I remember most fondly, armadillo was not an animal you ever heard of by any means and it always puzzled me. Sitting inside her living room was a small cabinet proudly displaying all of the ornaments and glasses collected as if they were fine china, juice glasses, once peanut butter containers, adorned with spades, clubs, hearts and diamonds, tumblers with gold writing, tall drinking glasses each with a different Care Bear or scenes of Newfoundland. Although cluttered with knickknacks and collections, everything was just so; everything had a place and was always sparkling clean. When Pop came home it was everyone to the table. Nan made sure you ate, that’s for certain because “a bit of fat on yer bones is healthy for ya, you know, by-gar you don’t want to be ugly with skinniness do ya?” She would scowl in one breath. You would scarf down supper always followed by a cup of tea and a few lemon creams. Pop would scoop half a jar of sugar and pour a fair portion of carnation milk into his strong brew of Red Rose or Tetley then he would siphon off a healthy portion into his saucer for me. The sugar would cut the teeth right out of your head and it always tasted better in a saucer. You always had your eye on Nan though because as soon as she was finished eating she was up from the table and scravelling around to clear the dishes, you’d better get that last bite in or she’d be haulin' the plate right from under your face, followed by “my-o-my,oh-my. Whats wrong with ya? You didn’t finish all your supper”, of course it was best not to answer, she wasn’t really asking a question; just her routine. After the supper dishes were cleared from the table Pop would take out the newspaper, I would sit in his lap listening to the soothing sound of the paper crinkling as he turned the pages and looking at his face as he peered through his thick black rimmed glasses that had several electrical tape repairs. I would watch his expressions and could tell if it was good news or bad. He always kept the comics or the funnies as he called them for last. I guess after reading the news its good to get your spirits back up with the funnies. We would move from the kitchen table to the big arm chair tucked away in the corner of the living room along side the fireplace while Nan sat in her recliner to watch The Price is Right. Bellies full, everything clean again we would doze-off from time to time taking a little nap. Pop would head back out to the kitchen table where he would start “doing his books.” He had an old blue typewriter and a black calculator in a leather-look case, yet he still had his old abacus which to me looked like a nice wooden toy with colored balls. Pop never minded me fiddling with the abacus or plunking away at they keys of his typewriter although the keys were spaced just perfectly for little fingers to get stuck in between. Milk and cookies or Dixie cups or perhaps a bag of chips and a Pop Shop birch beer were in order late in the evening while we watched some “shows”. My chubby freckle-faced teenage uncle would sit in the corner slurping cheese slices down whole and giving me sly looks, always jeering at me. My Aunt would walk gracefully through the hallway, pass the living room and out the front door. She lived out back, in a tiny in-law apartment. She was the pretty one, tall and slender with long chestnut brown hair, always “dressed up like a sticka chewin gum” my grandmother would say. It would soon be bed time so up the stairs we would go, I was always afraid of going up the stairs into the darkness; the switch was at the top so Pop would walk up with me at night. I spoke with him and never told him that I held his hand tightly because I had my eyes closed the entire way up; But I think he knew. To the right of the top of the stairs was the big bathroom with a claw-foot tub that seemed like a small swimming pool to me. The tub had a white cotton floor mat proudly displayed over the side with Texas wrote across it in large brown letters, one of the gifts Nan had gotten from her sister who married a “foreigner” and moved away; to Texas of course. Teeth brushed, face washed jammies on then on to bed. “I am Sam, Sam I am” or “On the fifteenth of May, in the jungle of Nool, In the heat of the day, in the cool of the pool” as Pop read one of my Dr. Seuss bedtime stories. I would almost be to sleep when I would hear the soft yet fast zip-zip, zip-zip of him winding his watch like clockwork. My grandfather passed away when I was 12 years old and now my grandmother has passed away (updated), I have to ask the question where have all the grandma’s gone? Times have changed; the grandmother and grandfather that rocked in the chair and crocheted, cooked three meals a day and kept a strict yet simple routine are an endangered species. My grandmother, while the same grandmother I had as a child, has changed. Only 25 years older, she no longer cooked or knitted, its up in the morning, get a bite of breakfast then off to the mall, Tim Horton’s for coffee and restaurants for lunch. What happened to the purple bandanna, pink curlers and Red Rose Tea? Her hair was now always just so, done at the salon “all I got in this life is me bitta hair, I deserves that much” she utters every time she went to the salon, as if she is trying to convince herself of that but for some reason carries some underlying guilt. Salon hair, restaurants, cabs and busses, my grandmother had evolved into the modern day grandmother; my younger cousins never knew the grandparents I once knew, same name, same people, different times. Time changes everything but what have we lost? Perhaps the very image of a grandmother that many of us have; a plump rosy-cheeked lady, rocking in her chair, a lavender-purple cotton bandanna tied on her head with a stray pink foam curler peaking out from the side of her ear. 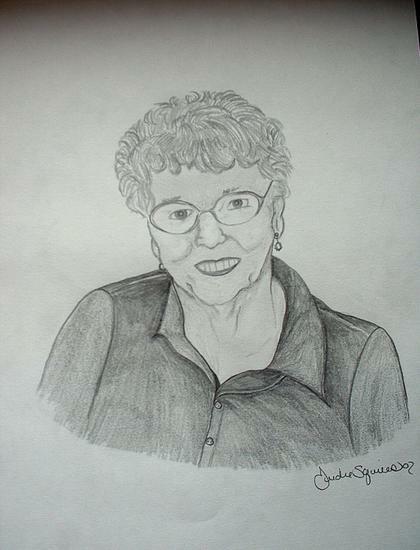 What a beautiful picture of your grandmother,you are so gifted,to be able to draw a portrait so well like that by hand! And your writing! It's as if I am there,while I'm reading,you really described the experience as if you had just gone back in time,and lived it all over again,as you were writing,it's so vivid and beautifully detailed.And what a gift to your grandmother,thanks for sharing it with everyone,it's just beautiful.